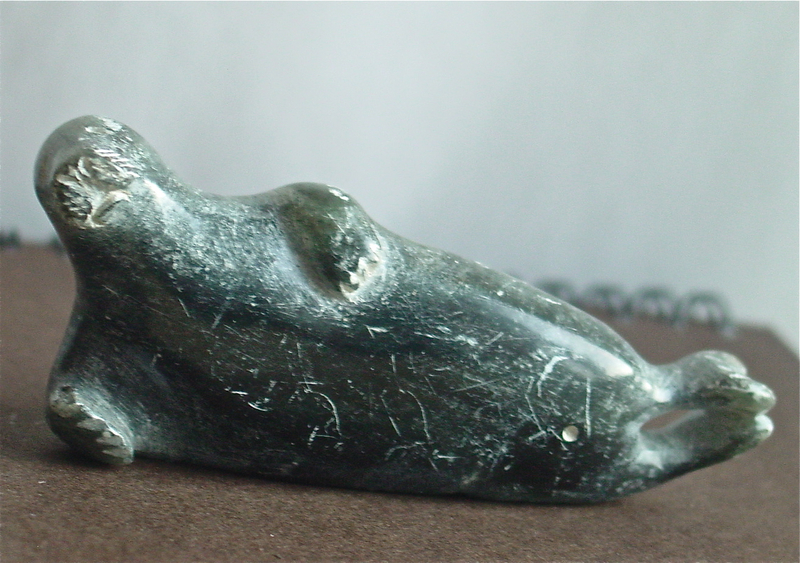 I went to the 50 percent off sale at Value Village yesterday and found this amazing little sculpture of a seal reclining on his side. I love sculpture — especially figures of animals and especially,especially ones that make me feel happy. This guy puts a big smile on my face. The piece is signed Simon Shaimaiyuk. Shaimaiyuk (1915-1999) worked in Pangnirtung, Nunavut. The area had been a whaling centre since the 18th century and many of his works deal with childhood memories of the last days of the whaling industry and traditional hunts. Shaimaiyuk is best known for his works on paper, which hang in many museums including the National Art Gallery, but he started out carving small objects. Seals also provide childhood memories for me. My dad’s side of the family worked in the sealing industry and when I was little, my Grandmother would tell me stories of when she was working as a cook on her uncle’s ship. I have the same super-wide feet as my grandmother. She always told me that duck feet were good. Like snowshoes for running across the Labrador snow.